Hungry for another contest? So are we! We're so hungry for your love and affection that we've decided that this month we're going to give away some more free DVD's to you, our diehard NGP fans. 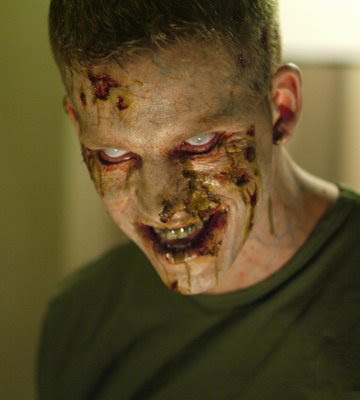 Being that October is All Hallows Eve month, we thought it would only be appropriate to carry this festive (spooky) spirit into our gift-giving, and have decided to give away 5 free copies of the Day of the Dead 2008 zombie remake flick. To enter, all you have to do is email us with the subject line "I Have The Need To Feed!". You don't even have to write anything in the body of the email - yes, we're making it that easy to win! Make sure you send us that exact subject line because if you submit a clever gaming variation (e.g. I Have The Need For Speed!) then your entry will not be valid. And we wouldn't want that to happen now would we? Especially when zombies are on the line. Send the email to our contest mailbox at contest@nextgenplayer.com. The deadline for submission is midnight on October 31, 2008. This contest is restricted to our Canadian visitors only. Remember the deadline for submission is October 31, 2008. Winners will be chosen at random on November 1, 2008. For NextGen Player's standard contest rules and all that legal mumbo jumbo, check out our contest page.